So, it’s not really going well so far. 9th place after 9 weeks isn’t spectacular. Now, I personally believe that anyone on the “Klopp Out” side is, excuse me, an absolute idiot. He’s still the most world-class signing Liverpool have made in a decade, maybe two, maybe more. At the minute, there’s absolutely zero chance we can do better than him. I’m sure there are plenty of loyalists who’d take good ol’ Rafa Benitez back, but we shouldn’t look to the past if we want to move forward. We’re only 9 weeks in, and if you look at his tenure, he’s improved players dramatically like Lallana, Moreno, Can, and Firmino. He’s gotten us into more cup finals than we ever did with Brendan Rodgers. And what I believe is most important as a fan, he’s usually got us playing some entertaining football. Going back to Rafa’s disciplined yet uninspiring football would be particularly jarring. Long story short, getting rid of Klopp isn’t the solution. And yet, we’re underperforming. Sure, we’re only three points away from fourth place, but most fans and pundits alike will tell you that Liverpool is currently falling short. What needs to change? What I find particularly interesting is how clear Klopp’s tactical philosophy is on paper. Klopp has opted for a 4-3-3 formation. On Monday Night Football, he told Jamie Carragher that this isn’t so important, it’s more to tell the players which areas of the pitch they must defend in. And while the team is fairly fluid in attack, players typically remain in these “zones” to which they’ve been assigned. 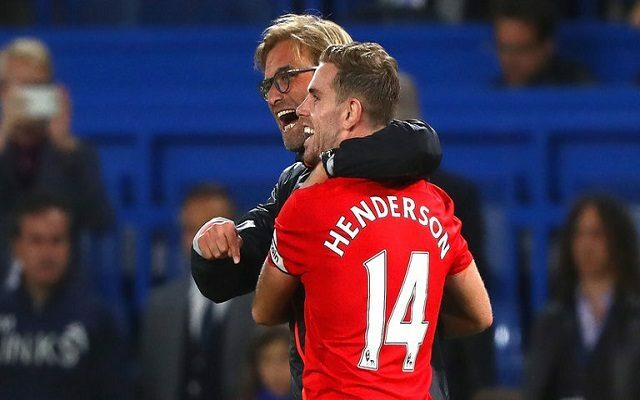 Jurgen Klopp prefers his number 6, Jordan Henderson, as a deep lying playmaker, dictating play and starting attacks. The two number 8’s in front of him, press hard, recycle possession and add bodies in attack while still coming back to defend in a typical box-to-box fashion. Currently, with Firmino in the false-9 role, his job is to lead the press going forward and draw defenders out of position for the inverted-wingers in Salah and Mane to operate as inside-forwards and carry the goal-threat while the full-backs bomb forward and provide width. However, despite it making sense on paper, Liverpool constantly concede goals despite not allowing the opposition many opportunities. Now, aside from the ridiculous amount of individual errors from players such as Mignolet, Lovren, and formerly Moreno, I believe the issue lies with the lack of a defensive midfielder. With everyone “gegenpressing”, it appears according to Klopp that you don’t theoretically need a defensive midfielder. Someone to break up attacks and shield the defence as the whole team should be taking on that role. No need for a Hamann, a Mascherano, a Lucas. If everyone plays that role, then the number 6 can have a different, more positive function in the team, and contribute to attack. The problem is that with no-one effectively shielding the high line that Jurgen likes to play with his defence, Liverpool have been prone to conceding. Don’t get me wrong, as I said earlier, the individual errors from our defence has been dreadful, but they aren’t solely to blame. It seems that Jordan Henderson and Emre Can, Jurgen’s preferred number 6’s, aren’t protecting the back as well as their conditional counterparts. This is less important with teams that play a double-pivot in central midfield with 3 at the back, because they already have an extra man. Teams that don’t, well, one could argue that that a proper ball-winning defender, an anchor-man is a necessity. Over the years we’ve seen the importance of Claude Makelele, Roy Keane, Nemanja Matic, as well as the three names mentioned above, Javier Mascherano, Lucas Leiva, and Didi Hamann. The idea of playing with a deep-lying playmaker as the number 6 has been seen before, namely with Steven Gerrard under Brendan Rodgers, Andrea Pirlo at Juventus, and Xabi Alonso at Bayern Munich. However, anybody who watched them regularly would tell you that while their vision was superb and beneficial in contributing to attack, they were all a liability defensively. Now, you can argue, as many did, that that was because those three players were all in their mid-thirties and didn’t have the legs to keep up anymore. As such they were often targeted by the opposition as someone to press heavily and man-mark. However, Jordan Henderson is not in his mid-thirties. As we all know, Jordan Henderson runs his socks off for the team. This same problem that Gerrard, Alonso, and Pirlo all faced shouldn’t be an issue, right? Unfortunately, not. Sure, Henderson isn’t a victim to a heavy press as those three, but the key issue remains that a sole deep-lying playmaker as a number 6 is not effective simply because they inherently do not offer the defence the necessary protection they require. This article is not a criticism against Jordan Henderson. As far as I’m concerned, he’s far too often used as a scapegoat. Unfortunately, for me, the blame lies solely on Jurgen Klopp for setting up his team this way. However, it seems like a problem that can be remedied. The problem in question being how many goals Liverpool are conceding and their defensive lapses. Rather than relying on the number 6 for creativity, perhaps the number 8’s should take more responsibility. This has shown to be effective, particularly when Coutinho has been deployed in central midfield. Should Mignolet and Lovren be replaced? Absolutely. They are both prone to errors. Simon Mignolet doesn’t effectively command his area and offers little else besides his “shot-stopping”. Dejan Lovren is seemingly not suited to a high line. As far as our best XI is concerned, I wouldn’t have Emre Can or Gini Wijnaldum there either as Can is far too inconsistent and Wijnaldum doesn’t offer much besides his patented ability to “recycle possession”. Despite this, regarding our defensive issues, it’s not just individual errors despite what the 4-1 defeat at Spurs would tell you. There is a systemic issue with the way Jurgen sets up his team, and unfortunately, I don’t believe Liverpool will be particularly successful without adequate shielding of our defence. At the very least, it would potentially reduce the amount of opportunities for our defence to make errors that lead to chances on goal. Overall, Jurgen Klopp is still the man for the job, he just needs to change his strategy.